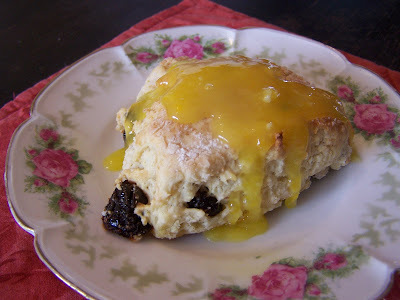 Craving something just a bit sweet, I knew scones would be perfect. I am not a sweets lover, and for the most part, have little to no sugar most days. Scones are the perfect low sugar pastry, and super simple to put together. At the farmers market Saturday we bought a stewing rooster and a bag of chicken feet from a farm where they raise organically fed, humanely treated, out in the fresh air foraging for bugs and weeds kind of chickens. I have read how good chicken feet are for your homemade stock, so I was glad to have a bag of them thrown in with the rest of our order. They actually make the stock quite gelatinous, which is the stuff that is super good for you! So we started our huge 16 quart stock pot first thing yesterday morning, dipped a couple quarts out for some homemade soup around 5 pm, then continued to let the whole thing simmer for a few more hours. By 10pm we were straining it, picking out the good meat, and popping it in the fridge to cool overnight before freezing it this morning. All ready for whatever soup fancy comes to mind! So far we've used it for some escarole and cannellini bean soup, and some coconut curry squash soup. I couldn't even get my Hubby to look at that picture,lol! 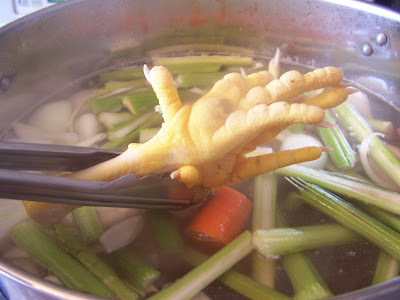 I have never used chicken feet....now I will have too so I don't wast anything! You are the only other person, besides my dear departed German grandmother,that I know to use chicken feet! I don't know how grandma used them, but I remember her telling me that she would *pull their socks off* (before or after cooking?) and nibble on the knuckles! It was pretty revolting to me as a child even though I grew up on their farm. She also liked pigs feet (pickled). I hated opening the refrigerator to find them front and center and right at my eye level! I think I will stick with eating the more traditional parts for now! Years ago when my children were little, I used to shop in a sweet little ethnic grocery. Everytime we went in there my kids would stand at the meat counter and just stare facinated by the LARGE mound of chicken feet, lol. That was before we were country people. I also wanted to remark on your lovely scones! I am a scone-aholic. I simply love scones and these look D-VINE!! Blessings to you dear one! that foot picture is hilarious! LOL Cindy!!! You should have been here to see the look on my Calvin's face when he realised what was in your tongs!!! LOL!!!! I have stock on the stove right now...but sadly, sans feet. ;-) Yum yum...I *love* chicken stock...soooooo good. Still praying for you and your family. The scone looks really good and yes that chicken foot looks really nasty, lol but I bet it was delish. Homeopathic medicine is known as a normal type of therapeutic!